Background: The seeds of Lens culinaris Medikus belong to family Leguminosae and are commonly known as masoor pulses, Lentils, and Lens esculenta Moench. Objective: The present review provides an up-to-date information on the therapeutic potential of Lentil seeds including its synonyms, taxonomical classification, geographical distribution, cultivation, pharmacognosy, phytochemistry, ethnopharmacology and reported biological uses. Updated Information: Geographically, L. culinaris seeds are grown throughout North India. They are lens shaped, grayish brown in color with mucilaginous taste and characteristic odor. They are well known for their nutritional properties and are also considered as a vital part of a balanced diet. Besides their contribution to health due to the presence of essential macro- and micro- nutrients, they also contain various bioactive phytochemicals such as phenolic compounds, saponins, etc. which are responsible for exhibiting various pharmacological properties. The Lentil seeds are traditionally used to treat gastrointestinal problems such as dysentery, diarrhea, constipation, strangury, cardiac disorders, skin diseases, anemia, etc. Due to such an attractive ethnopharmacological profile, various studies have been conducted on Lentil seeds which recommend the use of Lentil seeds as antioxidant, antibacterial, antifungal antihyperlipidemic, etc. Conclusion: This would assist the researchers to get a better insight into Lentil seeds. 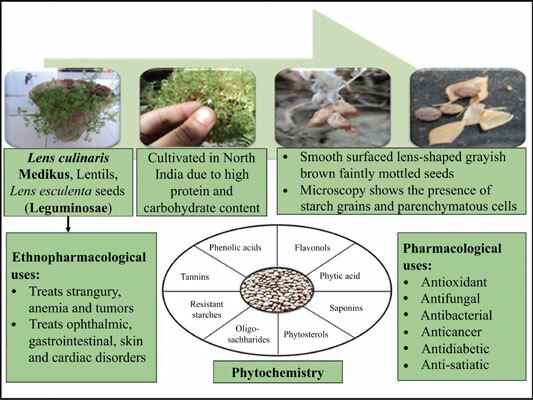 Edible pulse, Lens culinaris, Lens esculenta, lentils, pharmacological uses, phytoconstituents.